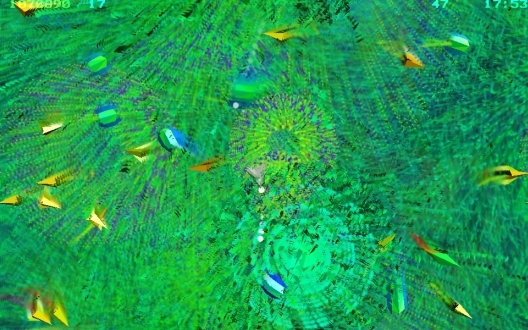 Forget planet Niburu, here's Spheres of Chaos 2012! First released in 1992 for the Acorn Archimedes, re-released in 1998 for PC. 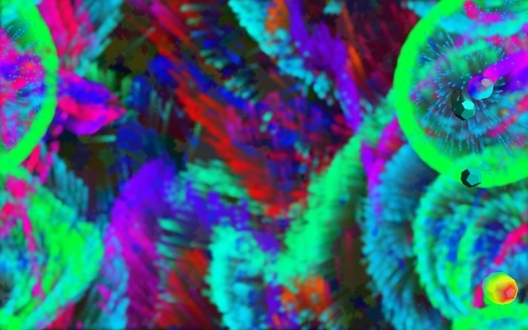 And now, updated for XP/Vista/Windows 7, and looking more psychedelic than ever. 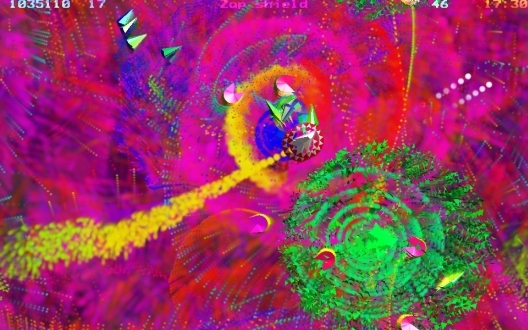 Imagine a world where instead of using his experiences with LSD to become an evangelist of therapeutic psychadelia, Timothy Leary had instead opted to learn assembler and program low-budget shmups for pc-download. For those unable to afford even the smallest portion of crack, Spheres of Chaos will dilate the pupil of your third eye and give you change from a fiver. This is no usual Asteriods family member, SoC is the difficult nephew. The one with all the good albums who stayed out late and got that girl into trouble back in school. Those particle effects? You can recognise the family traits as being present and correct, but somewhere in the past you can see some Minter has entered the bloodline. You're going to be glad very soon that SoC doesn't really vacate from the Asteroids paradigm, because whilst the basic game is in the same world - visually, this has vacated the previous galaxy. This is the anti-asteroids. Whereas Logg drew his space pure, flat and black - exquisitely cut with bright white - McLeod gives you all the colours. All at once. And then he cycles them. 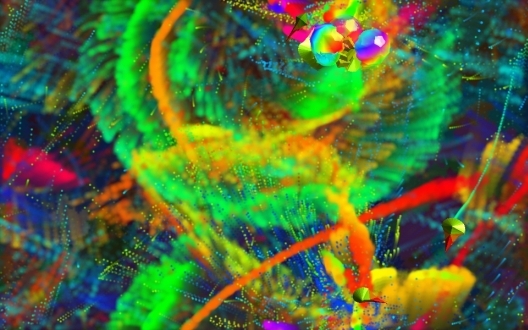 Spheres of Chaos delivers a psychadelic experience that one would be remiss to not experience. Taking the simple concept of a single ship shooting various sized space objects from the sky, Spheres of Chaos delivers an eye-boggling visual encounter using up to 130,000 pixels to create firework explosions, rockets and trails. ...an astonishing range of levels and enemies - enough to keep even the most dedicated gamer occupied, although their sanity after extended play might well be doubted... Confusing, explosive, enticing fun - not to be missed. It may hurt the eyes after sustained play, but Spheres of Chaos is worth all the effort. Shoot a rock crystal and it is as likely to leak liquid pixels as explode in a shower of space dust. I've been playing Spheres for years and I've suffered no adverse long-term health effects. At risk of qualifying for an entry in Private Eye's 'Pseuds' column, the game bombards you with melodic chimes and chords; huge, brightly coloured graphics and bursts of coloured particles, and I don't think there's a brain that won't be affected by the sheer volume of sensory data. 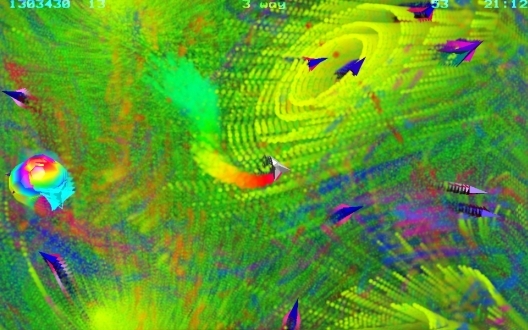 Spheres of Chaos is a startling reminder that games don't need to span multiple CDs or use 3D acceleration to be great; ...the visual effects are utterly hypnotic. I just downloaded Spheres of Chaos, and I was simply blown away by the beautiful graphics and intriguing gameplay! The sound effects are absolutely amazing, tremendously complex, and mind tingling!. They rock the walls of the room with the sound running through my home stereo system. Just thought I'd let you know, your game is really, really cool! I spent most of last night playing the full version of Spheres of Chaos, and I am totally hooked!